Deteriorating security in Central African Republic (CAR) forced UNHCR to relocate CAR refugees from the border area of Worobe in DRC to the new camp of Mole, 35 kilometers from the border. United Nations humanitarian agencies today voiced deep concern over the situation in the Central African Republic (CAR), where hundreds of thousands of people continue to be affected by lawlessness and insecurity, and widespread fear is reported among residents. Adrian Edwards, spokesperson for the UN High Commissioner for Refugees (UNHCR), said the agency was continuing to see “forced displacement” within and from CAR. Nearly 63,000 refugees have fled to neighbouring countries since the latest political crisis in the country erupted in December last year, according to UNHCR. Some 40,500 people have fled to the Democratic Republic of Congo (DRC), while another 13,000 have gone to Chad. Violence erupted in December 2012 when the Séléka rebel coalition launched a series of attacks. A peace agreement was reached in January, but the rebels again seized Bangui in March, forcing President François Bozizé to flee. “UNHCR is again calling on the CAR Government to do more to ensure the safety of people and their property across the country, to avert further displacement and suffering,” Mr. Edwards stressed. 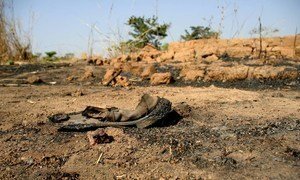 He also noted that night attacks in Bangui, the capital, have become increasingly common, including among aid workers who are threatened, robbed and injured. “In rural areas, widespread fear is reported among the civilian population, who are responding in some cases by organizing vigilante groups,” Mr. Edwards said. The UN World Health Organization (WHO) said that unless access to health services improves in the country, children and women will be at risk of contracting communicable diseases and there may be a resurgence of cases of malnutrition among children under the age of 5.
WHO spokesperson Tarik Jasarevic said 70 per cent of people in the country lack access to health services, based on a rapid evaluation exercise. “Many health facilities were not functioning due to looting, movement of health workers, non-payment of wages and breach of the medicines supply chain,” he said. Meanwhile, the UN Children’s Fund (UNICEF) said its emergency teams have been working for the past few weeks to restart health services in Kaga Bandoro and Bambari, two of the districts where health facilities had been looted and immunization chains destroyed. The teams “represented the first extended United Nations presence in the conflict-ravaged interior of the country since December last year,” said spokesperson Marixie Mercado. She added that emergency teams are working in every location it was safe for them to be in. Funding remains a problem for UN humanitarian agencies and their partners, according to the UN Office for the Coordination of Humanitarian Affairs (OCHA). The $195 million humanitarian appeal for CAR is only 32 per cent funded, having received $62 million so far. Of that, 23 per cent was carry-over from last year. OCHA spokesperson Jens Laerke said some sectors were particularly poorly funded or not funded at all, particularly the Early Recovery and Emergency Shelter sector and the Water, Sanitation and Hygiene sector. In addition, the 30 project proposals submitted mainly by non-governmental organizations (NGOs), but also by UN agencies, to improve vulnerable people’s access to safe water and proper sanitation did not receive any funding. The UN Security Council in New York is scheduled to discuss the situation in CAR tomorrow. The prosecutor of the world’s first permanent court set up to try those accused of genocide and war crimes today voiced her deep concern about the worsening security situation in the Central African Republic (CAR) and reports of serious crimes being committed there.